I'm trying to understand how this site works. I have a very good answer to this question about stopping door weatherstripping squeaks. But it requires a 10 reputation to answer the question. I am new here and have no reputation at all. So my helpful answer will not be heard because of website politics. This does not seem fair to the person who needs the advice. I got to the meta section to comment about the website and it requires a 5 reputation. Is this a website to help people with their home improvement questions or a toy for some control freak who doesn't care about the poor guy who needs to deal with his home improvement issue and loves politics and raising the stress level of the little guy? I can't even post this topic in the correct place because I have no reputation and no possibility of building a reputation. I will be surprised if you even allow this to be seen by others. I do sincerely apologize if I misunderstood something here and would greatly appreciate being pointed in the right direction. I can't even create a tag for this topic that I am not allowed to post in the section it belongs in, more politics and no help. Sometimes questions on the site have to be protected, for one reason or another. Part of the protection includes not allowing users with 0 reputation to answer. We're not trying to ignore good information, just trying to squash spam and other such nonsense. If you want to earn some reputation, try answering some questions that are not protected. Alternatively, you could ask an on topic question or two. 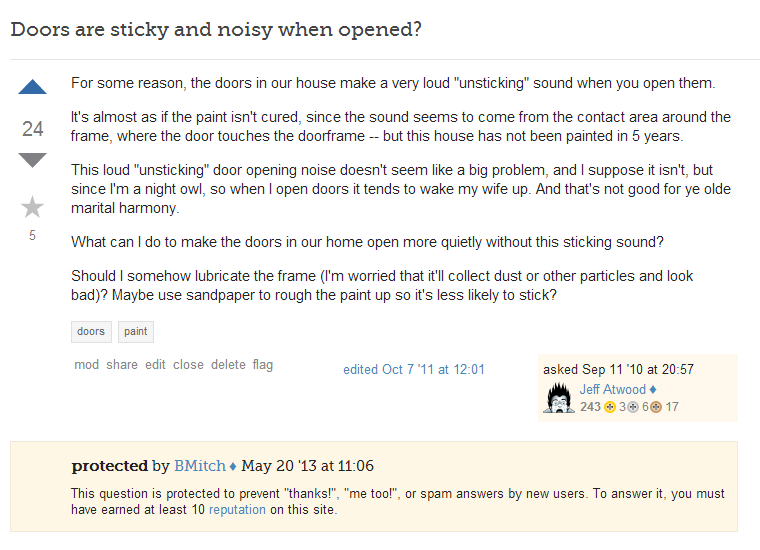 Doors are sticky and noisy when opened? I believe the notice at the bottom of the question explains quite well what "protected" means. Since it's a question asked by Jeff Atwood, it seems to have attracted quite a bit more attention than typical questions. It appears that it was starting to get some "I have this problem too", low quality, and spam answers. Seeing as the question already had 9 good answers (including an accepted answer), our moderators felt that protecting the question was the correct action to take.